Breeding mealworms couldn't be easier. Unlike superworms, they will morph into beetles in a colony so you don't need to separate them and "stress" them out for them to change. 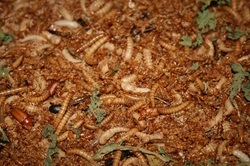 Mealworms are a popular feeder for many reptiles. It should be noted that they have more chitin in their shell and one should really research the diet for their particular reptile to know if they are an appropriate feeder that will not cause impaction. For more information on the nutritional value of mealworms please visit our feeder information page. You will have meal aliens arriving in no time. Temperature does play a role in how fast meal worms develop in their life cycle. These "aliens" are the next step in the meal worm life cycle and you are that much closer to having egg producing beetles. You may leave these aliens in the substrate with the other worms and beetles. Some people take them out. The choice is yours. Important in keeping aliens from becoming food for other worms or beetles is having enough food and hydration for the others in the tub. Separating the aliens does ensure they will be safe from predation though. I simply have put them in a cup. They do not need food or moisture. Providing them enough food and hydration is important. Forgetting to feed them and hydrate them is the number one cause of meal worms dying. Keeping the humidity on the lower end of the spectrum requires ventilation in the tub. Keeping humidity down is also a preventative measure to avoid a grain mite infestation. 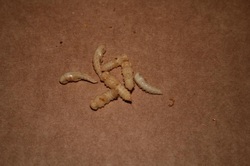 You simply have to to transfer your meal worm beetles to another bin every couple of weeks or create a screen bottomed container and change the bottom container once every few weeks to keep your worm sizes approximately the same. 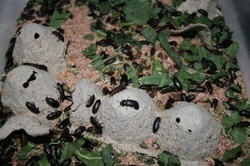 Keeping the beetles fed and hydrated also keeps them from eating the small worms or eggs. Once you move your beetles to another tub after a few weeks be sure to treat the bin as if their are live creatures in it. The babies are so small that you will not see them. They need hydration even if you do not see them. Before you know it you will have a container of writhing meal worms. Two videos on meal worm (super worm) breeding and care. The second video illustrates a strainer to separate the meal worm from the substrate. Using ground oats makes that process a lot easier.